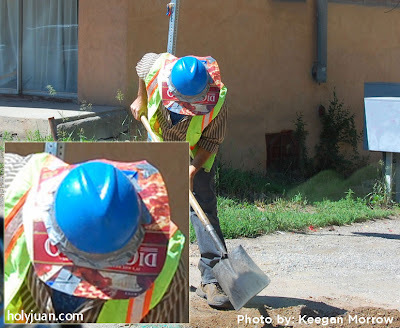 My buddy Keegan saw this handy road worker while passing through a road construction site in New Mexico. I'm sure that if MacGyver were of Hispanic descent and stuck on a road construction site with nothing but a hard hat, a pizza box and a knife (and the obligatory duct tape), he'd do the same thing if the sun was in his eyes. you forgot the ubiquitous duct tape. Whatever it takes to get the job done!! I wish he worked for me!!! Ask HolyJuan: What Shall I Take in My Suitcase?